Horsham, Pa., is one of many towns around the country grappling with potentially harmful chemicals in its water. They're known as PFAS, and they're linked to cancer and other illnesses. The EPA is working on a plan to manage PFAS but members of Congress are pushing the EPA to move faster. A few states already have established strict new standards to limit the compounds in drinking water. And in some places, such as the Philadelphia suburbs, PFAS pollution has become an issue in mid-term election races. As scientists and policy-makers work to limit human exposure to the compounds here are a few key points that are worth knowing. PFAS chemicals are good at repelling oil and water. That makes them useful in a lot of products including non-stick cookware, fast food wrappers, pizza boxes, water-repellent fabrics and fire-fighting foam. It's difficult to pin down exactly how harmful these chemicals are because research is limited. There was a big health study involving one form of PFAS in the Mid-Ohio Valley. From that and other studies scientists are comfortable saying certain diseases are linked to PFAS exposure but they won't be more definitive than that. "PFAS chemicals have been linked to a wide range of health effects, including cancer, low birth weight, thyroid disease, elevated cholesterol and effects on the immune system," says Laurel Schaider, research scientist at Silent Spring Institute. Manufacturers have agreed to stop using two forms of PFAS in the U.S. These chemicals take a long time to break down in the environment, which is why they remain a problem now. And Schaider says there are still many questions about the safety of newer forms of PFAS chemicals are still being used, though some people believe they are safer because they remain in the environment and in our bodies for shorter periods. In some communities PFAS pollution may be known by another name if a specific compound is to blame for problems there. Some of the most common are PFOS, PFOA and Gen-X. PFAS is the overall name for this group of several thousand chemicals. Among the places with PFAS pollution is Michigan where the some residents were warned not to drink the water for a month. In New Hampshire there are concerns a landfill may be polluting water. 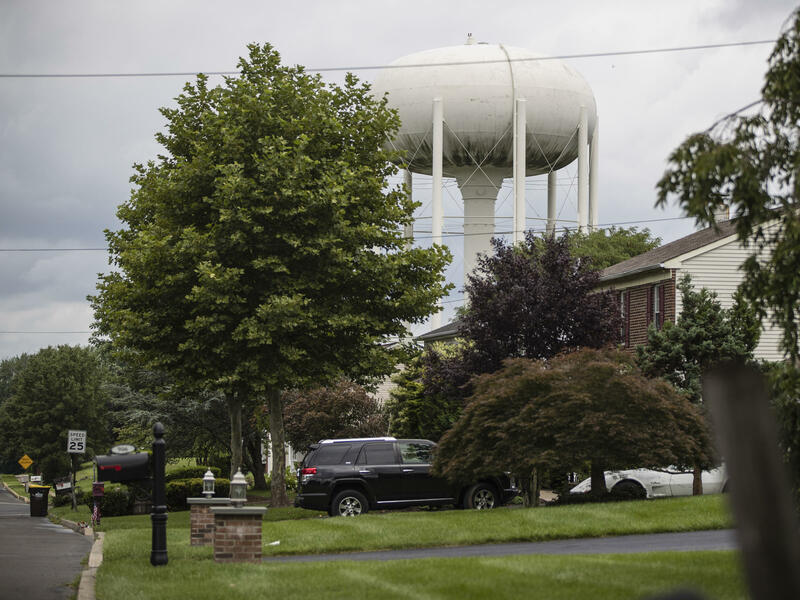 A case in New York came to regulators' attention after a resident tested his own water. And in North Carolina high levels of a PFAS chemical were found in drinking water downstream from a manufacturing plant. A map of contaminated sites and communities where PFAS has been detected in drinking water has been compiled by Northeastern University and Environmental Working Group. The EPA required most water utilities to test for a list of PFAS chemicals from 2013 to 2015. In 2016 the agency lowered a non-binding health advisory limit for some PFAS compounds to 70 parts per trillion (ppt). That's about 70 grains of sand in an Olympic-size swimming pool, says Christopher Crockett, chief environmental officer for the water utility Aqua America. But environmentalists argue that a Centers for Disease Control and Prevention study indicates the numbers should be much lower. A few states have set lower standards on their own. The EPA is working on a plan to manage PFAS chemicals and expects to release it by the end of this year. "We need actions to come out of those plans that lead to clear direction for water suppliers," says Crockett. He wants to know what level of PFAS chemicals in water is safe and when should his company install filters to remove the chemicals. The Department of Defense also has a big role to play in cleaning up PFAS pollution. The agency uses fire-fighting foam for training at air bases around the country. In places like Pennsylvania PFAS chemicals from that foam have made their way into local drinking water. When utility company Aqua America learns it needs to treat water polluted with PFAS it installs big carbon filters. If you're worried about this issue and want to be extra cautious, you can essentially do the same in your home. Christopher Crockett with Aqua says filters on refrigerators that dispense water or pitchers with carbon filters work pretty well—just make sure you change the filters regularly as manufacturers recommend. If you want to also limit exposure from taking showers or brushing your teeth then a whole-house filtration system might be necessary. When asked if he filters his water, Crockett says he does not. He's comfortable that water under the current EPA health advisory level of 70 ppt is safe to drink. Water is not the only concern though. Laurel Schaider with Silent Spring Institute says it could make sense to avoid things like fast food wrappers and microwave popcorn bags that can have PFAS chemicals in them. The problem is you never know which ones to avoid because there are no labeling requirements. The state of Washington will eventually ban PFAS use for food packaging and fire-fighting foam. Around the country, people are learning that their drinking water is polluted with a potentially harmful group of chemicals. They're called PFAS - P-F-A-S - and they're linked to a number of illnesses, including cancer. The Trump administration is working on a plan to regulate them. Some in Congress are pressing for it to move faster. NPR's Jeff Brady has been looking into this and joins us now. Hi, Jeff. SHAPIRO: First of all, what are these chemicals? BRADY: PFAS - it's an entire group of several thousand manmade chemicals, and some of them have been around for decades. These chemicals are good at repelling oil and water, and that makes them really useful for all sorts of products, like non-stick cookware, coatings on fast food wrappers, pizza boxes. And the places where PFAS are used in manufacturing, those are generally the places that are the most polluted. There are some sites in New York, North Carolina, Michigan just to name a few places. PFAS also are in firefighting foam used at airports and military bases. In some cases around the country, the chemicals have migrated into local drinking water, and the estimates on exactly how many people are affected vary, but it's safe to say that the number is in the millions. SHAPIRO: How harmful to people can these chemicals be? What kinds of problems do they cause? BRADY: The research is limited, so it's hard to pin down exactly how harmful these chemicals are. Scientists will say PFAS are linked to certain illnesses. Here's Laurel Schaider. She's a research scientist with an advocacy group called the Silent Spring Institute. LAUREL SCHAIDER: PFAS chemicals have been linked to a wide range of health effects, including cancer, low birth weight, thyroid disease, elevated cholesterol and effects on the immune system. BRADY: Manufacturers have agreed to stop using two forms of PFAS in the U.S., but these chemicals take a long time to break down in the environment, and that's why they are still a problem now. SHAPIRO: And how are regulators responding to this, especially given the uncertainty? BRADY: The EPA requires most water utilities to test for a list of PFAS. And in 2016, the agency lowered a nonbinding health advisory limit for some PFAS chemicals. It's now 70 parts per trillion. I'm told that's about 70 grains of sand in an Olympic-size swimming pool. And some environmental advocates argue the level should be even lower than that. But all this uncertainty, it creates confusion, especially for water companies like Aqua America. It's based in suburban Philadelphia. Christopher Crockett is the chief environmental officer there, and he says companies like his need clearer direction from the EPA and from policymakers. CHRISTOPHER CROCKETT: To be able to explain to the public am I above or below a safe level here? And do we need to put treatment on in this community, and how soon? And that still needs to be determined, and that needs to be determined as soon as possible. BRADY: Now, the EPA is working on a plan to manage PFAS chemicals. The agency just wrapped up a series of public meetings around the country. The plan is expected by the end of the year. SHAPIRO: The Trump administration has been so staunchly anti-regulation, especially rolling back protections meant to keep people safe from environmental contaminants. Why are they responding differently to this? BRADY: An issue like this, it really fits in with the way the Trump administration has tried to narrow the focus of the EPA away from things like climate change and toward issues such as clean air and clean water. Also we should keep in mind that the EPA is still working on its plan to manage PFAS chemicals, and we don't know what that plan is going to look like until it's out sometime in the next few months. SHAPIRO: So what could people do to protect themselves today? BRADY: Well, the water utility Aqua that we heard from just a minute ago, they've installed these big carbon filters to bring the levels down. And that works. The utility says the water is safe to drink. If you're still worried about it, those filters that you get in a refrigerator or in water pitchers, those will bring the levels down, too. But I've talked with people here who still just don't trust their water, that it's safe, and they're continuing to drink bottled water. SHAPIRO: That's NPR's Jeff Brady. Thanks. SHAPIRO: And tomorrow, we'll visit a New Hampshire town where there's concern that these chemicals are leaking from a landfill into drinking water. Transcript provided by NPR, Copyright NPR.